Well, maybe Manual isn't the best word, because I'm certainly not going to go through every screen and every button in Gmail and tell you what it is. But what I do want to offer is a few tips on how to make your Gmail experience more enjoyable and less confusing. These are things that I wish everybody knew because they would make Gmail a much friendlier place for beginners. So, on with the tips. When Gmail upgraded to the new look last year, they made a lot of great improvements. One of which, was that they removed the text labels from the buttons in gmail to help save space and make the interface look more sleek. Unfortunately, this was only a positive change for power users. For the rest of us, we were left wondering what the little icons on all the buttons meant. The good news is that you can turn the labels back on. 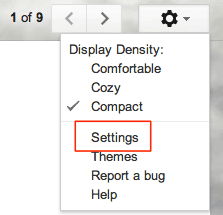 Click the Gear Icon in the upper right-hand corner of Gmail and then click Settings. Now scroll down and change the option next to Button Labels to Text. Don't forget to hit save at the bottom of the window. Much better, right? Sure it's not as sleek and Web 2.0-ish, but it sure beats guessing what that little stop sign is every time! 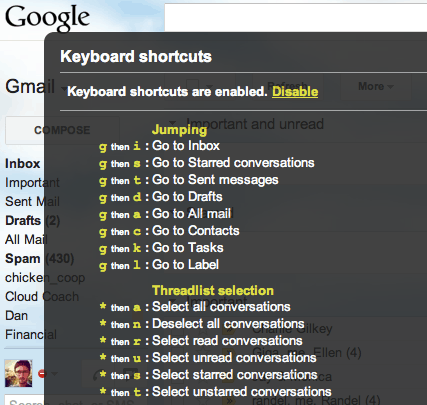 Gmail has a ton of keyboard shortcuts that will help you whiz around your inbox like a pro. Unfortunately, not many people know how to even learn what they are. The good news, is that you just have to memorize one of them. Yes, there is one keyboard shortcut to rule them all. Obviously, if your cursor is in a text box, you'll just end up typing a question mark. This week my friend Joel Zaslofsky hosted me on his excellent Smart and Simple Matters Podcast. We talked a lot about my philosophy on email overwhelm and technology in general. Joel's message is all about simplifying the systems in your life in order to get more done, save more money, and have more time. It's definitely a theme that I talk about here on Cloud Coach, so give it a listen! Shameless plug: If you think you've got a handle of how Gmail works, now it's time to clean up the mess that is your inbox. You can grab my free Email Ninja Kit to learn how to reduce the size of your inbox with just a few simple techniques. I always find it ironic when a company spends a huge amount of time and brain power putting out an amazing piece of (often free) software, but then skimps on the user manual. Do you ever run into things like this in your experience with technology? 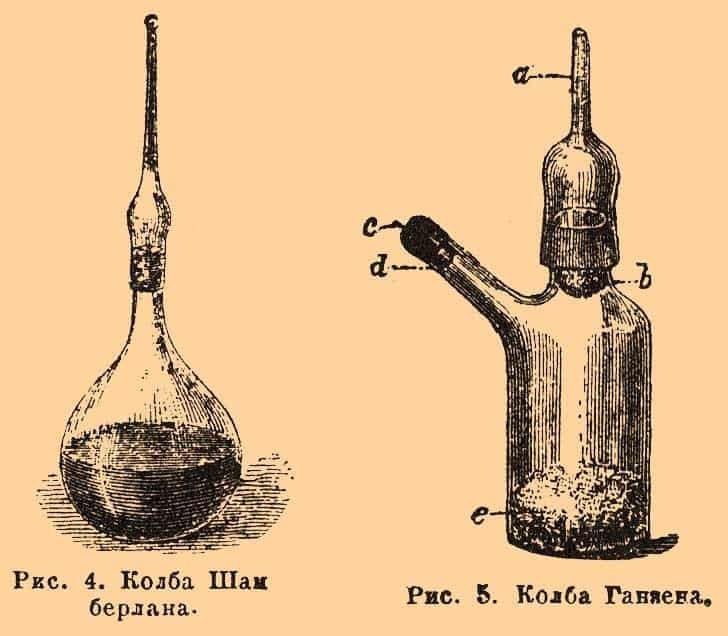 What are your favorite tech tools that lack good instructions?